Our Jewish Values in Israel – Vote Now! In a world where we feel that we need Israel more than ever, as a homeland, a source of pride and inspiration for all Jews everywhere, and in the worst situations (God forbid), a refuge for us all, our voices have never been more important in helping to determine the Jewish values of our shared national home. Judaism asks all of us to stand up for the rights of the oppressed, and to stand up for our own rights to a place that is for all Jews. The values of Reform Judaism deserve a home in Israel too. Please join Temple Beth El in casting your vote for Reform values in Israel – here is the easy way to do so. 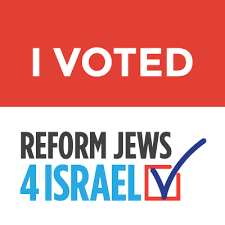 Vote today: Register with the American Zionist Movement and vote at https://www.reformjews4israel.org/ for the ARZA-Representing reform Judaism today. Spread the word: Share this link (https://www.reformjews4israel.org/) with your friends on Facebook. Let them know that it is important to you and that you voted. Send a copy of your Thank you for voting! page along with your name and address to kwilson@carolina.rr.com. Please let us know if the registration fee of $10.00 for those over 30, and $5 for those between the ages of 18-30, is a hardship for you. Our Temple Beth El goal is 100% participation. Register, vote, share and send us your voting confirmation so that we may track and report our progress!